123 Design can perform all necessary Electromagnetic Compatibility, Environmental, and Electrical Test Services. 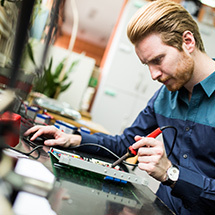 From connectors and the smallest electronic components to trucks and construction equipment, we have the expertise to handle the broadest range of product testing. 123 Design bring years of electrical engineering expertise to the processing of electrical representations (analog or digital) of time-varying or spatial-varying physical quantities, or signals, vital to the design of complex components.